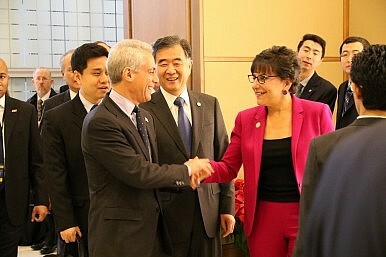 Secretary Pritzker and Vice Premier Wang Yang thanks Los Angeles Mayor Emanuel for hosting the 2014 JCCT. The United States and China wrapped up their annual trade and investment-focused talks, the Joint Commission on Commerce and Trade (JCCT) on November 23 in Guangzhou, China. The talks were co-chaired by Secretary of Commerce Penny Pritzker and Trade Representative Michael Froman on the American side and by Vice Premier Wang Yang on the Chinese side. Just as the United States and China were butting heads over the South China Sea issue at a series of regional summits, Pritzker, Froman, and Wang brought their delegations together in Guangzhou to discuss economic ties – traditionally the strong foundation of the U.S.-China relationship, but now increasingly another point of contention. In addition to long-standing concerns about intellectual property rights (IPR) infringement, market access, and currency manipulation in China, the United States has added cyber espionage and theft of trade secrets to the top of its agenda. In the past two years, Washington and the U.S. business community have also been fretting over perceived Chinese attempts to hamstring foreign firms operating in the country through anti-monopoly probes and a national security law that could force foreign tech firms to hand over their source code to the Chinese government. Meanwhile, China continues to bemoan restrictions on high-tech imports to China, and to complain about the suspicion that greets Chinese companies seeking to invest in the United States. Beijing is also wary of the newly-completed Trans-Pacific Partnership deal, a 12-nation trading agreement that excludes China in pursuit of what U.S. officials call “high standards” on issues like IPR protection and market access. After the dialogue, Pritzker claimed “meaningful outcomes on this year’s issues like trade secrets, pharmaceuticals and medical device market access, [and] competition policy.” In diplomatic parlance, that means baby steps forward on issues no one really expected to be solved. On IPR protection, China made the latest in a long line of promises to tweak its system for protecting intellectual property. “China clarified several ongoing and intended efforts to revise China’s trade secrets system and provide more effective aspects of its civil judicial system to deter and respond to the misappropriation of trade secrets,” the USTR said in a statement. That includes a focus on preventing counterfeit goods from being sold online, with plans for the United States and China to hold regular discussions about the issue and compare best practices. China also made new commitments to fight unauthorized broadcasts of sporting events and other media programming. As a sign of good faith, China’s Commerce Ministry highlighted its fight against pirated online content and counterfeited goods sold online in the weeks prior to the JCCT. As for fair competition, the United States delegation received more assurances that China is “committed to nondiscriminatory and transparent policies for ICT information security” – including an affirmation that “Chinese banks are free to purchase ICT products regardless of the country of origin.” That point comes after reports that China was moving to force its banks to use only servers from domestic Chinese companies, due to national security concerns. The United States also pressed China to continue to open up market access to foreign firms, particularly in the services sector, which Beijing has pledged to do as part of its economic restructuring. For its part, China received acknowledgment of its concerns on the restricted atmosphere for Chinese investment in the United States, but no serious movement to address the problem. Likewise, on U.S. restrictions on high-tech exports to China, Pritzker said that the United States and China would “develop a mechanism to improve the exchange of information on individual cases of commercial high-tech items exported to China” – progress, but hardly satisfying to China, which consistently lists the export restrictions as among its top trade concerns. Meanwhile, there was no mention in the official fact sheet from the U.S. government of progress on a U.S.-China bilateral investment treaty. After optimism early in 2015 that the two sides could make strides this year on negotiations, talks seem to have stalled over the “negative lists” (the list of industries both sides would want to remain shut to foreign investment). Still, despite all the warning signs and entrenched disagreements, U.S.-China trade continues to grow. This year, China is poised to overtake Canada to become the United States’ largest trading partner, for the first time ever. According to Chinese customs data, China’s overall trade volume with the United States was up 2.4 percent year-on-year through the first ten months of 2015 – even as China’s total foreign trade dropped 8.1 percent year-on-year through the same period. We have seen some progress, but a real deal remains difficult.